I absolutely love what was accomplished – it was exactly what I had hoped. I now honor my mother by wearing her ring on her birthday, the day she passed away, and her wedding anniversary. It was great to work with Designing Jewelers on my mother’s ring, and I continue to use them for all of my jewelry needs. After being worn with love for 50 years, Deb’s mother’s wedding ring was in rough shape. The band was thin and broken and its main stone had been lost. Deb had the ring in a drawer, but desperately wanted to return it to its glory days. 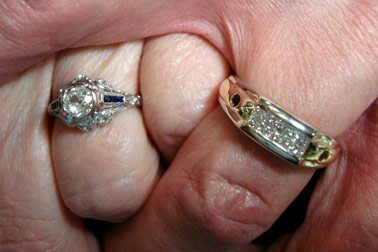 To restore Deb’s ring, Designing Jewelers carefully selected a new diamond that matched the other stones. They focused on color and clarity. The prongs were then repaired and the new diamond set. 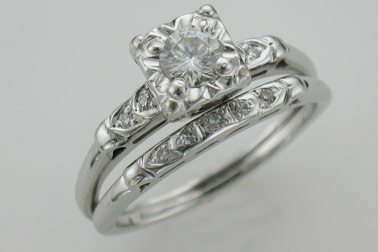 The ring was cleaned, polished, and ready to bring a smile to Deb’s face! Each restoration project is unique, but the process always starts with an honest conversation about what needs to be done, the approximate cost, and time frame to complete the project. It is a great day at Designing Jewelers when we help people restore a memory. Telling Deb we could refurbish her mother’s ring was the highlight of my day. I know the ring brings a smile to Deb’s face every time she wears it, and that is exactly what we work to do.